Bioinspired computation methods such as evolutionary algorithms and ant colony optimization are being applied successfully to complex engineering problems and to problems from combinatorial optimization, and with this comes the requirement to more fully understand the computational complexity of these search heuristics. This is the first textbook covering the most important results achieved in this area. The authors study the computational complexity of bioinspired computation and show how runtime behavior can be analyzed in a rigorous way using some of the best-known combinatorial optimization problems -- minimum spanning trees, shortest paths, maximum matching, covering and scheduling problems. A feature of the book is the separate treatment of single- and multiobjective problems, the latter a domain where the development of the underlying theory seems to be lagging practical successes. 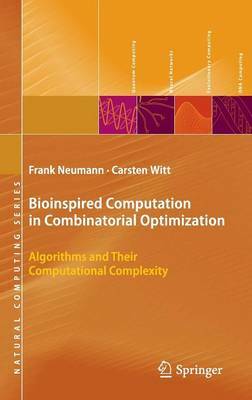 This book will be very valuable for teaching courses on bioinspired computation and combinatorial optimization. Researchers will also benefit as the presentation of the theory covers the most important developments in the field over the last 10 years. Finally, with a focus on well-studied combinatorial optimization problems rather than toy problems, the book will also be very valuable for practitioners in this field.